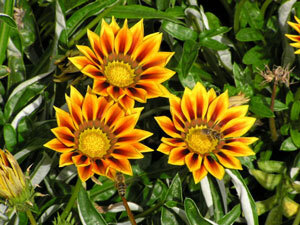 Gazania rigens is native to South Africa, where it is called Rankbotterblom by Afrikaaners & Ububendle by the Zulu. It is distributed in America as Treasure Flower or Rainbow Daisies. It's a showy & highly drought tolerant tender perennial grown in our zone as an annual, very easy from seed sewn directly into the garden. Alternatively, seeds can be started in trays for maximum number of plants, but it's easiest to sew them directly into the places they are wanted, in spring after all threat of frost has passed. They do occasionally perennialize, but even in the best of circumstances weaken after a few years, & should be started anew from scratch. Sometimes they can be induced to reseed themselves. It has naturalized in California as an invader species; & given that it is included in so many wildflower mixes, seems apt eventually to naturalize in regions of the Southwest. It does well as a transient annual. 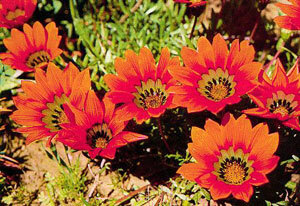 In such temperate regions it must be grown in fullest sun, but may prefer a bit of protection further south or inland. Although the foliage is trailing, flowers are very upright. It grows half a foot to a foot tall, & requires no care to keep blooming from May to first frost. It has an extravegant array of color varieties. Color ranges from white, cream, yellow, orange, pink, red, single-colored, bicolored, or striped. 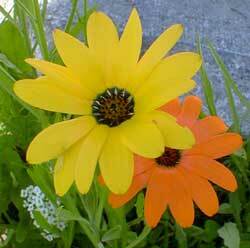 There are many named cultivars, but ours are just random gazanias from a seed mix. Although they look so much like daisies, unlike daisies, they're just not suitable for cut flowers, because they close their petals when sun is not brightly upon them, thus make a very poor showing indoors. They are ideal for garden edge filler, xeriscape gardens, or containers.